In putting together this post, I’m actually surprised it’s taken me so long to write about Dave Lieberman, one of the most knowledgeable food writers–if not the most knowledgable–in Orange County. I don’t remember when we became friends or why (likely food related), but at the launch of this blog nearly a year ago, he became my farmers market guru, leading me through rows of unfamiliar fruits and veggies at the Irvine Farmers Market. What’s a dandelion green? Well, it’s something that tastes great with warm bacon and mustard vinegrette, he says. If the peaches aren’t at the peak of their season yet, even just by a couple of weeks, the dude can tell on taste alone. And he’ll wait the extra week to buy them, no matter how good they might look. In the overall transition from fast food junkie to Fat Dude on a Diet, Dave has taught me the importance of understanding where food comes from and how best to use it. He’s also become a great personal friend; Wifey Nadia and I love spending time with him and his fantastic family. With all that said, you know I couldn’t miss the chance to learn one of the most basic-yet-integral skills in all of Kitchendom–the simple art of making pasta from scratch. Learn to do it like the pros after the jump. 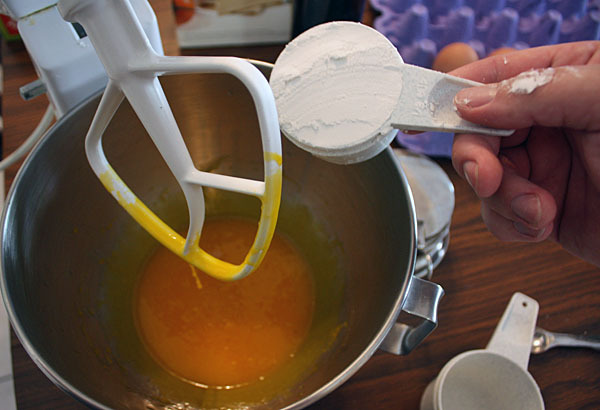 In a mixing bowl, combine the flour, egg yolks, salt, oil and 2 T of water in pulses, scraping down the bowl once. 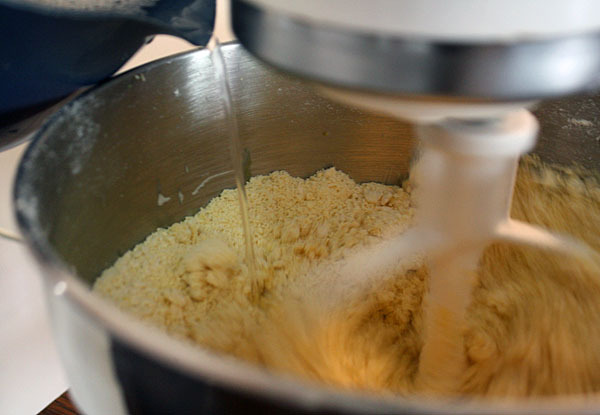 Turn the mixer on a low speed and pour water into the mix just until the dough holds together when pinched. 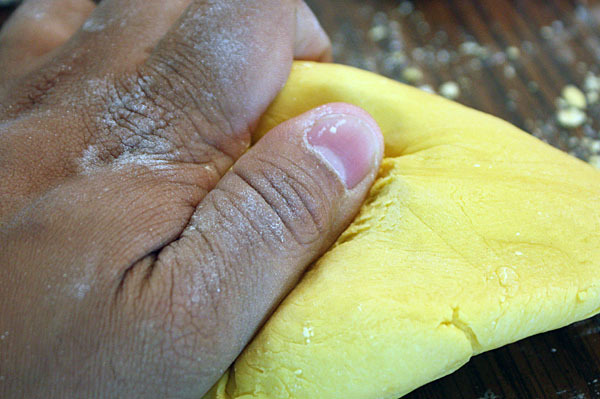 Turn out the dough onto a dry counter–it will be very crumbly–and knead until smooth and elastic, about 8-10 minutes. You should be able to dent it with your fingers. Wrap the dough in plastic wrap and let it rest at room temperature for 60 minutes. 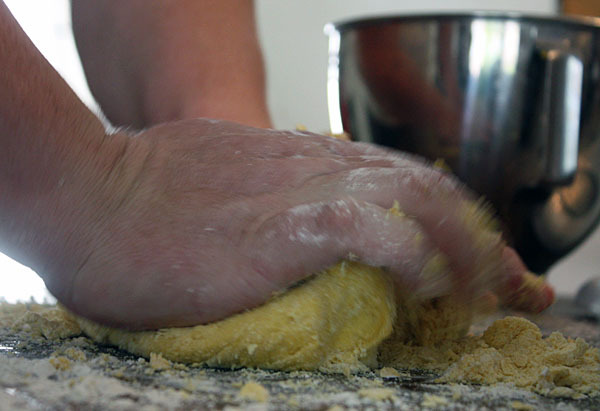 Working with half the dough, and keeping the other half covered, either run the dough through increasingly higher numbers on a pasta roller and then cut into noodles, or roll by hand with a French pin on a floured surface. Chop up the sheet for whatever use you have. When ready to cook, drop the pasta in boiling water for 2-3 minutes. 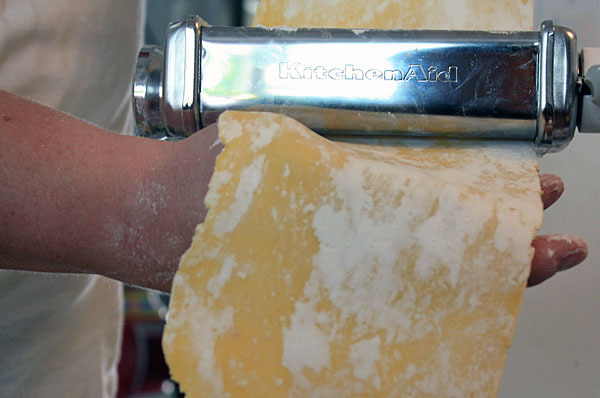 Fresh pasta cooks faster than dry pasta, so be on your toes and don’t overcook your hard work! 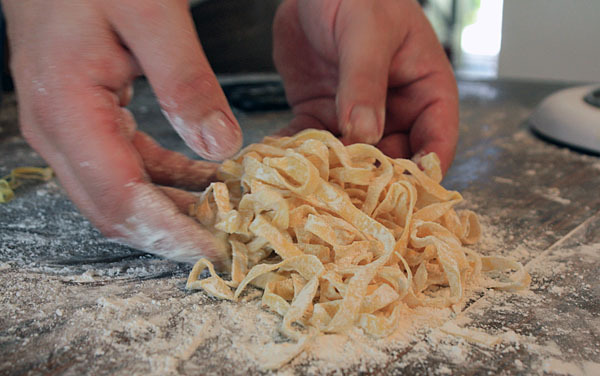 If you’ve never had fresh pasta, you’re truly in for a surprise. 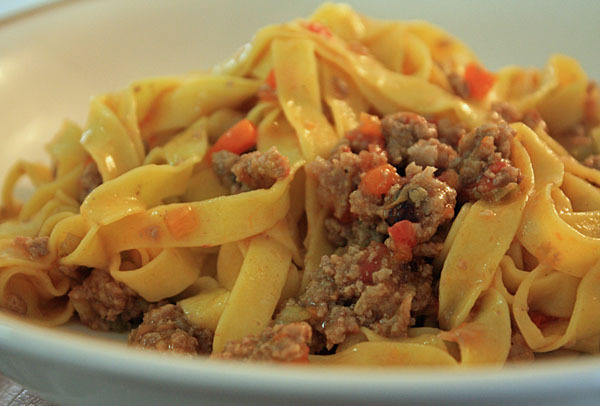 It’s tender and chewy, but most important, it’s fresh and tastes so much better than dried pasta. I’m not hating on the dry stuff, but if it’s between a box of Barilla or this stuff, you better believe that box is staying on the shelf. Thanks Dave for the tutorial and the delicious lunch that followed! Need more Lieb? 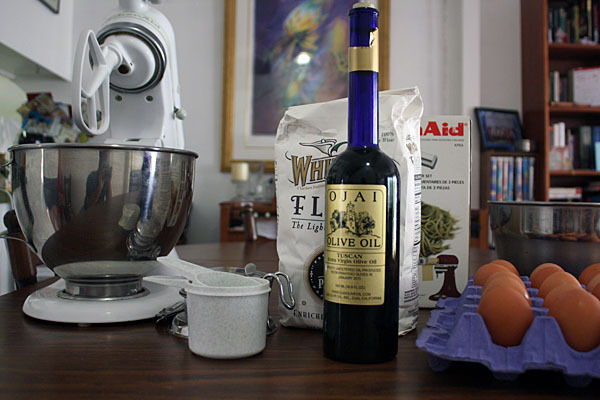 Follow Dave and his fellow food bloggers at OC Weekly’s Stick A Fork In It.